Shelter Medicine for Veterinarians and Staff, Second Edition is the premier reference on shelter medicine. Divided into sections on management, species-specific animal husbandry, infectious disease, animal cruelty, shelter programs, behavior, and spay/neuter, the new edition has been reformatted in a more user-friendly design with briefer chapters and information cross-referenced between chapters. Maintaining a herd health approach, new and expanded chapters address issues of husbandry, infectious disease management, behavior forensics, population management, forensic toxicology, animal cruelty and hoarding, enrichment in shelters, spay/neuter, and shelter design. Now in full color, this fully updated new edition delivers a vast array of knowledge necessary to provide appropriate and humane care for shelter animals. Veterinarians, veterinary technicians and shelter professionals will find this to be the go-to resource on the unique aspects of shelter medicine that help facilitate operating a modern, efficient, and humane shelter. Lila Miller, BS, DVM, is Vice President of Veterinary Outreach and Veterinary Advisor of the American Society for the Prevention of Cruelty to Animals in New York, NY. She is an adjunct assistant professor at the University of Pennsylvania School of Veterinary Medicine and Cornell University College of Veterinary Medicine. She is co-editor of the textbook Infectious Disease Management in Animal Shelters, and has over 30 years of experience working in the field of animal sheltering. Dr. Miller co-founded the Association of Shelter Veterinarians (ASV) in 2001 and served as a member of the task force that researched and wrote the ASV Guidelines for the Standards of Care of Shelter Animals. Stephen Zawistowski, PhD, CAAB, is the Science Advisor for The American Society for the Prevention of Cruelty to Animals in New York, NY. He holds a PhD in Behavior Genetics and is a Certified Applied Animal Behaviorist. He also is an adjunct professor at the University of Illinois College Of Veterinary Medicine and an adjunct faculty member in the Anthrozoology Graduate Program at Canisius College. Dr. Zawistowski is the founding co-editor of the Journal of Applied Animal Welfare and Science. 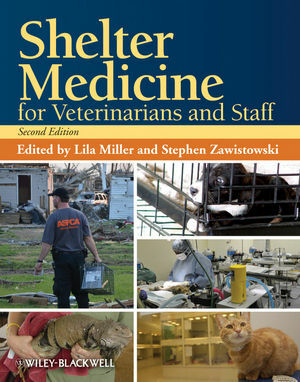 The second edition of this well-known shelter reference has been reformatted and expanded to include 12 additional chapters with new information on treatment and control guidelines of infectious disease, quality of life, population management, epidemiology, treatment options and the decision-making process in shelters, management of disease outbreak, forensic toxicology, animal hording, enrichment in shelters, and behavior forensics. The previous edition was 560 pages and the new edition is 736 with standalone chapters on nutrition and vaccination eliminated and moved to individual species chapters. Chapters are cross-referenced where applicable to reduce redundancy.